Report: LSE Special Event: ‘Can the Iranian Nuclear Situation be resolved without the use of force’? 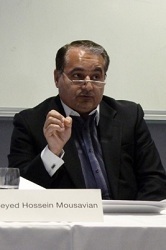 Seyed Hossein Mousavian is a Research Scholar at the Program on Science and Global Security at Princeton University. He is a former diplomat who served as Iran’s Ambassador to Germany (1990-1997), Head of the Foreign Relations Committee of Iran’s National Security Council (1997-2005) and as spokesman for Iran in its nuclear negotiations with the European Union (2003-5). Peter Jenkins is former British diplomat. Between 2001 and 2006 he was Britain’s permanent representative to the IAEA and UN (Vienna), where his primary focus was on the nuclear aspects of international peace, especially the Iranian nuclear issue. To download the podcast (35mb) right-click and save here. Since the International Atomic Energy Agency’s (IAEA) discovery of undisclosed nuclear facilities in 2003, Iran has come under fire over the essential nature of its nuclear program, and in particular its ability to produce enriched uranium. Though Iran insists that the program is strictly for peaceful purposes, it has been subject to international pressure, economic sanctions, and threats of military action. Escalating sanctions by the international community such as trade embargos, travel bans, bank freezes, and disconnection from the SWIFT has left the Iranian economy in tatters. Additionally, rhetoric from Congress has called for pre-emptive strikes and ‘blank cheque’ support for Israeli campaigns against Iran have put the country on the defensive. Yet despite the sanctions and sabre rattling, Iran has responded by expanding the program. Held on the 20th of March 2013, during the nuclear talks between Iran and the P5+1 in Kazakhstan, the LSE’s Special Event on Iran brought together two former diplomats from either side of the fence, the East and the West, to discuss the relevance and practicality the use of force against Iran. 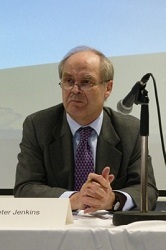 The first speaker, Peter Jenkins, was a former British ambassador with a 33-year diplomatic career, culminating with his 2001 appointment to the IAEA, a post he held until 2006. While there he specialized in the nuclear aspects of global security, and Iran’s nuclear program in particular. Similarly, the event’s second speaker, Sayed Hossein Mousavian, was Iran’s ambassador to Germany, the head of the foreign relations committee and Iran’s National Security Council, and spokesman for Iran on nuclear negotiations with the EU between 2003 and 2005. He is currently a research scholar on global security at Princeton University. Since leaving their respective offices, both speakers have advocated negotiated peace on Iranian nuclear issue. Reflecting back on his time as British ambassador to the IAEA in 2005, Jenkins discussed how the EU denied Iran’s nuclear development proposals on the basis that the dual-use enrichment technology (civil and military) brought Iran too close to developing nuclear weapons. At the time, Jenkins supported the EU’s decisions to reject the Iranian proposal and subsequent implementation of sanctions and threats of force. In 2007, however, Jenkins reversed his opinion upon reviewing the National Intelligence Estimate, which claimed that Iran had abandoned its pursuit for a military nuclear program in 2003. In light of this shift in threat, Jenkins felt that the West’s strategic stance ought to have similarly changed. Instead, Iran is being spoken of by the Western powers as one of the greatest threats to global security. Where there have been initiatives to talk, the West (and the US in particular) have demanded a host of requirements and have offered very little in return. Citing a 2013 US intelligence report on Iran, Jenkins suggests that the sensible policy would be to accept Iran’s enrichment program and try to shift the Iranian public’s view of the West instead of trying to coerce the government. In doing so, it would prevent Iran developing defensive feelings, which in turn is only further motivating an Iranian military nuclear program. 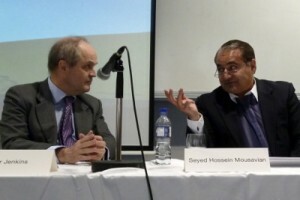 Advocating a similar view, Mousavian began his lecture by outlining the three major pillars of the 1968 Nuclear Non-Proliferation Treaty (NPT), which are 1) complete Nuclear disarmament, 2) prevent the spread of nuclear weapons and technology, and 3) encourage cooperation on peaceful nuclear technology. With these in mind, Mousavian argues that the five permanent members of the UN Security Council (China, France, US, UK, and Russia) have stockpiled over 20, 000 nuclear weapons amongst them, allowed non-signatory states such as India, Pakistan, and Israel, to develop nuclear programs, and prevent signing states (most notably Iran) from developing peaceful nuclear programs. In other words, the P5+1 have utterly failed in complying with the essential points of the treaty. Despite the compliance failure, the West uses the treaty as justification for the placement of draconian sanctions on Iran. Making an argument that parallels Jenkins’; Mousavian suggests that the problem is not Iran’s persistence on developing its civil nuclear program. Rather, it is the West (and the US in particular) and its unfair perception of Iran that is problematizing the peace process. As a signatory to NPT, Iran claims the right to develop a nuclear program that does not transgress the other pillars of NPT. It is this point that forms the basis of Iran’s negotiating position. The necessity of disclosure comes from international organizations (the UNSC) that have not shown the same respect. To this end, given the respect that Iran feels it has paid to the NPT and the rights it affords them to develop a peaceful nuclear program, it would seem that any subsequent resolution ought to be build around the framework of the NPT. This was, after all, the basis for the proposal that Iran offered the IAEA in 2005, which was subsequently rejected. The event wrapped up with an interesting and occasionally contentious question and answer session moderated by LSE’s Dr Chris Emery. With input from LSE staff, students and select invited guests, topics raised included shifts in US-Iranian relations, the future of sanctions on Iran, the role in the international community, and the role Israel’s perception of Iran in peace talks. While Mousavian acknowledged that the sanctions from the UN, the US, and others have devastated the Iranian economy, they have done little to deter the development of the Iranian nuclear program. To the contrary, the imposition of sanctions has only spurred Tehran to expand the nuclear program. According to Mousavian, prior to the imposition of sanctions, Iran had 1200 centrifuges, stockpiled only a few kilograms of enriched uranium, and kept the enrichment below 5%. Today, Iran has over 12,000 centrifuges and over 8 tons of uranium enriched to 20%. This speaks to Jenkins’ earlier point that the Western powers should abandon its coercive diplomacy and instead forge better ties with Tehran and the Iranian public. In addressing a follow-up question, both speakers agreed that there would have to be a shift in Israeli attitudes towards Iran before Washington would be prepared to alter its foreign policy decisions regarding Iran. The overarching point that both speakers made was that the West’s current course of action was ineffective and potentially dangerous. Contrary to popular opinion, US intelligence suggests that Iran is acting on the basis of cost-benefit analysis and seeks prestige and influence in the region. Moreover, the continued use of sanctions will only act to encourage a nuclear military program. Implicit in Mousavian’s talk was that Iran is ready to deal with the US. The problem, it would seem, resides in Washington. With a full house, a good mix of students, academics, special guests, and one particularly outspoken critic in the front row, the LSE special event on Iran’s nuclear program was a big success.